This page defines the term two-eye-formation. It describes independent life of strings having liberties exactly in two single point eyes. Note that this is not the only way in which a set of strings can be unconditionally alive; see Benson's Definition of Unconditional Life for a complete and mathematically rigorous analysis. A two-eye-formation is a set of one or more strings of the same player and exactly two empty intersections so that each of the strings is adjacent to each of the two intersections, none of the strings is adjacent to another empty intersection, and each of the two empty intersections is adjacent only to the strings. Here is an example of a two-eye formation with two strings of black stones. Here is an example of a two-eye formation with four strings of black stones. This is not a two-eye formation, because the empty intersection a, being next to a white stone, violates the condition each of the two intersections is adjacent only to the strings. Black can force a two-eye formation as in example 2. Before , we have a two-eye-formation. After , we no longer have a two-eye-formation. This may be quite counter-intuitive, but the definition of two-eye-formation is different from the typical meaning of "eye". However, if the players continue playing, then Black will be able to force getting a two-eye-formation again. In most cases, the informal "a group with two eyes", which is also known as independently alive, is not a two-eye-formation. 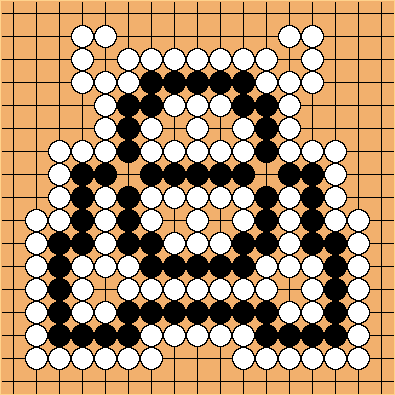 However, the alive player can force a two-eye-formation. The term two-eye-formation is relevant, e.g., for Chris Dam's theorem, which says that alive as defined by a good model of life as in the World Amateur Go Championship 1979 Rules is equivalent to alive as defined by the Japanese 2003 Rules. Two-eye-formation identifies a subset of chains that are pass-alive together with two empty intersections. 1990s: Informal language spoke of "group with two eyes" or some similar expression while mostly meaning a group with bigger eyespaces and possibly more than two eyes and only scarcely meaning exactly a group with two 1-point eyes. 1994: In Mathematical Go Endgames, Berlekamp defined a related but different term in a different way for greedy ancient rules. 2002-2003[? ]: Robert Pauli used the term in his Logical Japanese Rules of Go but defined it in a somewhat complicated manner integrated in his rules. 2003-08-24: The currently earliest found rec.games.go article. 2006-04-14: Robert Jasiek used the current form of definition for a Model for the World Amateur Go Championship Rules. It is possible though that he might have formulated it some days, weeks, or months earlier in a different study.